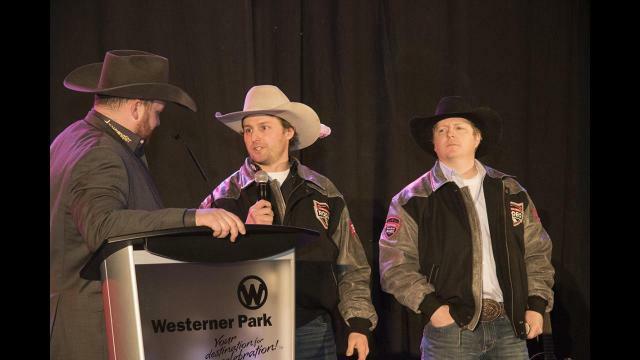 Dec. 1, 2017 8:00 a.m.
Westerner Park and the Red Deer and District Chamber of Commerce are putting in their bid to host the Canadian Finals Rodeo (CFR) in Red Deer starting in 2018 with CFR 45. The bidding group hosted a committee from the Canadian Professional Rodeo Association (CPRA) in order to win the opportunity of hosting the CFR. The group was presented with a tour and a presentation, followed by meetings regarding specifics of the bid. Specifics of the bid were not made public at this time, however it was announced the CFR would be hosted the week prior to the Agri-Trade Exposition, which is held in November every year. CEO of the Red Deer and District Chamber of Commerce Robin Bobocel said Central Alberta really resonates with western culture and the cowboys who compete in the CFR. “We really want to make them feel welcome and we feel we have a community that can back that up,” Bobocel said. Part of making the competitors feel welcome, according to Antifaiff, is having the right facility. “There is no question that us having the right facility to house the event and also the back of house services for livestock and the competitors’ horses makes us a natural choice,” he said. Red Deer may also be home to a new Rising Stars Rodeo every year in August. The rodeo would showcase the best up and coming cowboys and cowgirls. “We want to show the future of the sport and we want to make sure that future has a venue,” Bobocel said. “We want that venue to be here in Red Deer. We want Red Deer to be the home of rodeo in Alberta and Canada. The group didn’t announce whether infrastructure expansions were part of their bid to the CPRA. They did announce the term of contract they are seeking to host the CFR. Bobocel said Central Alberta thrives on partnerships like the one between the Chamber and Westerner Park. He said forging similar relationships with communities and organizations throughout the region is key to their bid. “That is how we get things done. It puts us above other regions in the province and the country and we have demonstrated that over the years. We will continue to do that with CFR 45,” he said. Antifaiff said this bid is an exciting opportunity for Red Deer and he believes their bid is a strong one. Bobocel was confident with the bid, despite Red Deer being the first name in the hat. “There is always a risk of being first, but if you are the best — you can be fine with that.,” he said.